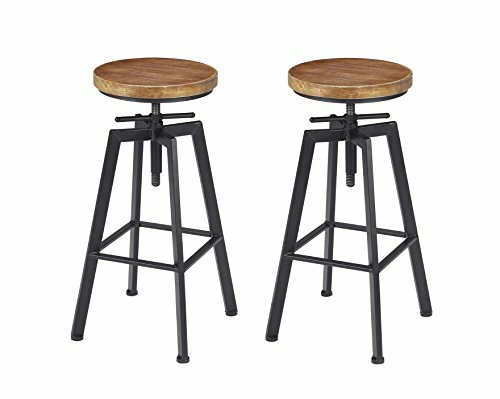 This adjustable round wood barstools chair is comfortable and anti-scratch. The vintage industrial style is simple but stylish. It's with comfortable and study footrest. It can offer reliable stability. Smoothly 360° swivel for 4 inch adjustable height and screws to immobilize. It's quite easy to assemble, clean and match all style furniture, perfect to use in bar, pub, home, balcony, kitchen etc. Many years later as he sitting here to drink coffee, Jony was to remember the scene of his age 6 when he with father assembled these tables and chairs which are from overseas manually in the garden. Vilavita comes from Fujian Anxi where is the origin of China solid wood. It inherits centuries handmade art. We use radiatapine, high quality wrought iron, green paint. On the base of high quality, it has more hand polished spirituality. Vilavita has a distinctive style which can be used for various occasions, not only LOFT, villas, gardens, balconies, but also coffee shops, bars, restaurant, shopping malls. If you have any questions about this product by VILAVITA, contact us by completing and submitting the form below. If you are looking for a specif part number, please include it with your message.